Mexican show jumper Eugenio Garza Perez comes from a long line of equestrians. Horses have been in his family for generations. Garza has moved quickly up the ranks since he came to the United States to train eight years ago. Working with trainer Eddie Macken, one key to his success has been his mount Bariano, which he purchased in 2012. The pair jumped to the gold medal at the North American Junior & Young Rider Championships in 2013, before moving on to Grand Prix classes. 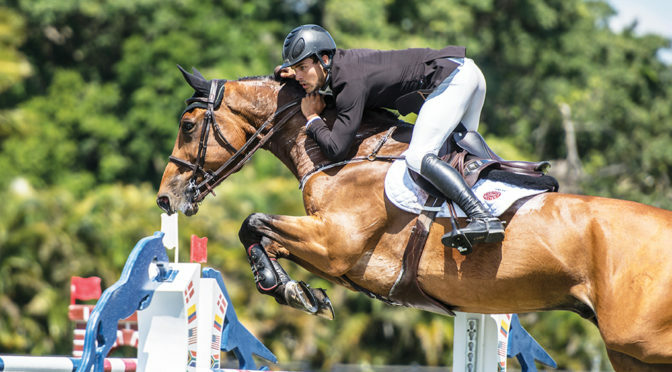 At WEF last year, Garza and Bariano claimed the $35,000 Bainbridge FEI 1.45m Classic during Week 3. He also placed fourth in the $50,000 Hermès Under 25 Series Final. Later in the season, he rode to victory in the $135,000 Longines FEI Jumping World Cup Columbus aboard Victer Finn Dh Z. Garza then headed across the pond where he and his Mexican teammates Federico Fernandez, Patricio Pasquel and Enrique Gonzalez shocked the Europeans by winning the Longines FEI Jumping Nations Cup of Ireland in Dublin last summer. In the fall, Garza and Victer Finn DH Z jumped to the lead in the $132,000 1.50m Horseware Ireland Welcome Stake at the Tryon Fall 4 CSI 5* competition.